A time of reminiscing. On last trip to the USA we also had an opportunity to be in Monterey California which seems to be somewhat old but very attractive town. There's something very peculiar and almost hypnotic about its beauty. We bought many souvenirs and there was this curious machine where one can drop a nickel and turn the machine handle a few times and Voila! You have a shiny bronze-colored dolphin shaped coin. 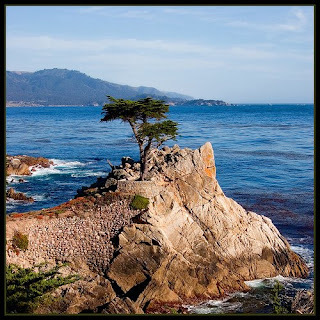 The most special place that we visited in the Monterey area is the Pebble Beach Resorts where we had a hearty picnic in the company of friendly seagulls desiring to share our food. I could have sworn that, that place must be almost as perfect as paradise. It's also a perfect destination for honeymooners, or for one who merely desires a relaxing and peaceful time in a safe and beautiful place.